Praana Praanee Praanayam is a must-have for all Kundalini Yoga practitioners and teachers, and for anyone interested in using pranayams (breathing exercises and meditations) to achieve mental clarity and inner balance. 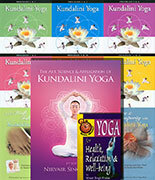 Well put together and abounding with beautiful illustrations and explanations, it is an in-depth and probably the most comprehensive collection of classic and never before published breath techniques to exalt the human spirit, as given by Yogi Bhajan, Master of Kundalini Yoga. 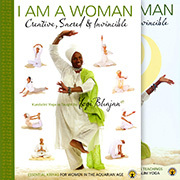 Drawing from an astoundingly rich wealth of yogic history, Yogi Bhajan reveals dozens of previously unknown and hidden techniques for enhancing spiritual, mental and physical growth - grouped appropriately into chapters and containing many practical (1-3 minute) techniques - making these practices very easy to access and assimilate. The wide range of praanayams and kriyas include: Karnee Kriya, Sahai Sukh Dhyan, Chattar Chaya Kriya, Sneezing Buddha, Kriya for Victory, Chakra Praan, Whistling Ardas Bhaee, Ashtang Agni Kriya, plus numerous alternate nostrils praanayams, and breathing in various stroke patterns. They work on so many levels: to calm the mind, relieve stress, develop virtues, increase breath capacity, connect to God, or just to build a new sense of a relaxed and confident self. Harijot Kaur, who compiled and superbly illustrated Praana Praanee Praanayam, has included some fascinating tips from Yogi Bhajan on the vayus, the nadis, praana and apaana, Breath of Fire, suspending the breath on the inhalation and exhalation, and whistling breath.